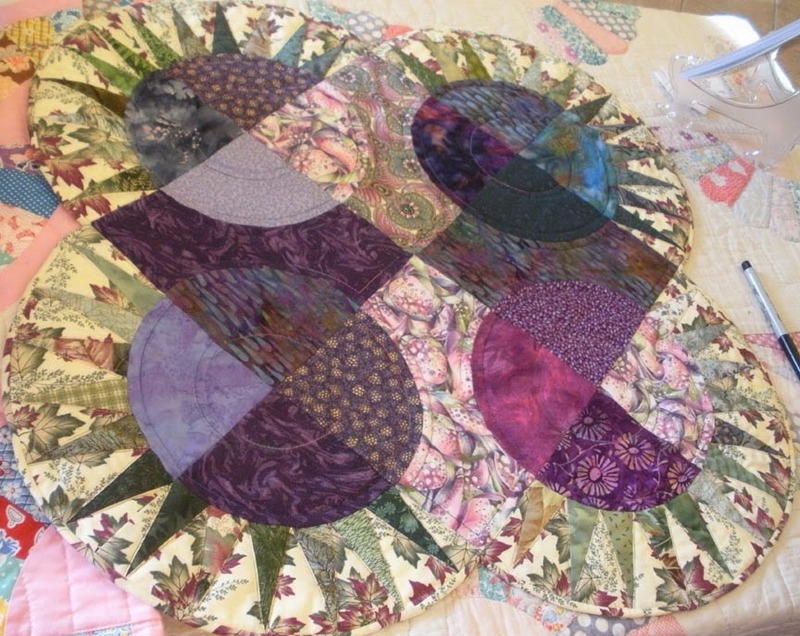 The patchwork is zipping right along. 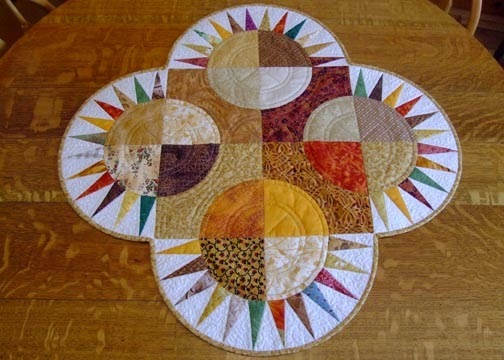 I have the block units all pieced and some sections pinned together to stitch. And every good quilter deserves fabric! "Tadashi" by Anna Fishkin for Red Rooster Fabrics, available at Mrs. Pugsley's Emporium. I scrolled back through my blog posts and see I started these in June...when I thought I had all kinds of time to finish. 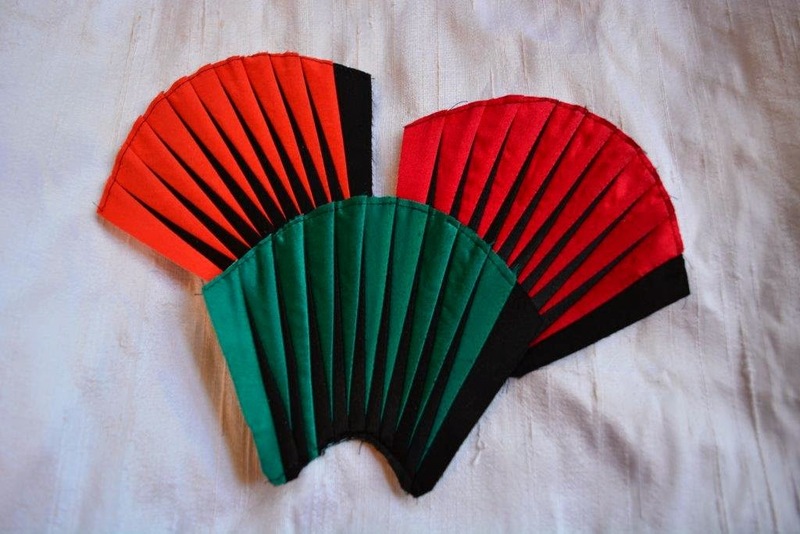 The blocks are very small (these fan sections are 2" x 3") and pieced in silk. It isn't patchwork which can be hurried as the silk is very unforgiving. There is no ripping out as it leaves holes so it's important to work carefully. I hear from the most interesting, creative people and Janice Luinstra of Calgary is one.Janice sent along some pictures to show what she has been doing with selvedges, including this tote bag made from one of my patterns. Janice writes, "I have enjoyed making these bags ...and have given them to my daughters, daughter in law, friends. Now I am making one to be donated to the Ujaama Grandmas sale Bags, Babies and Beyond in October in Calgary." 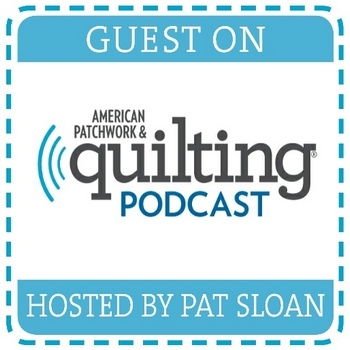 On a trip to Indianapolis to visit her daughter, Janice visited the local quilt store and mentioned to a person there that she was looking for selvedges. That person had been collecting them and was happy to donate a bag full to Janice. They connected again on Janice's next trip, and the woman gifted her with huge bins of selvedges. Lucky Janice! 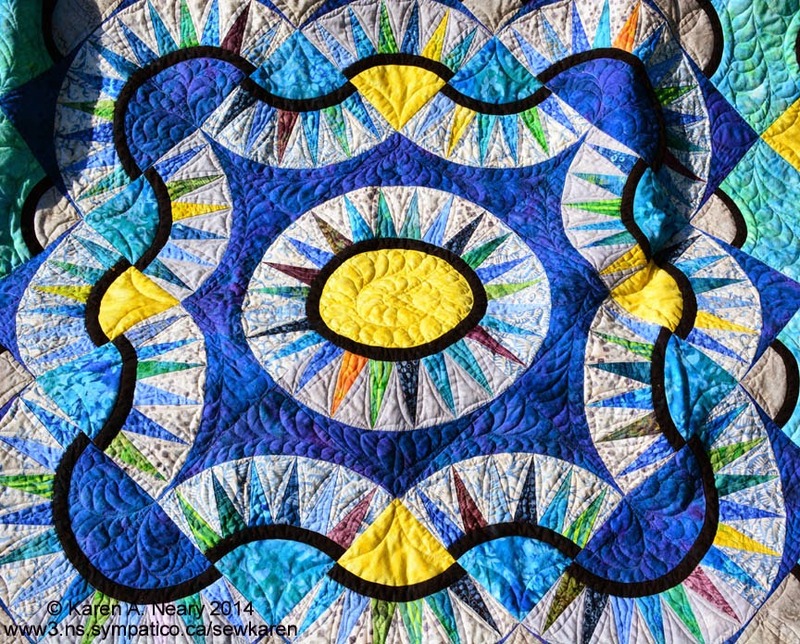 In addition to several tote bags, she also made a selvedge skirt for her daughter, which understandably garnered a lot of attention, and this fabulous quilt. Here's a shot of her huge selvedge stash (and I thought *I* had a lot!!) spread out so Janice can select just the perfect one for use in her work. Thanks so much for being in touch, Janice, You can find out the times and location for The Ujaama Grandmas sale here; if you are lucky enough to be in the Calgary area, you may come home with one of Janice's selvedge bags! Life is all about connecting. Networking and teamwork are paramount to any successful endeavour. When things come together it's a pretty wonderful feeling! 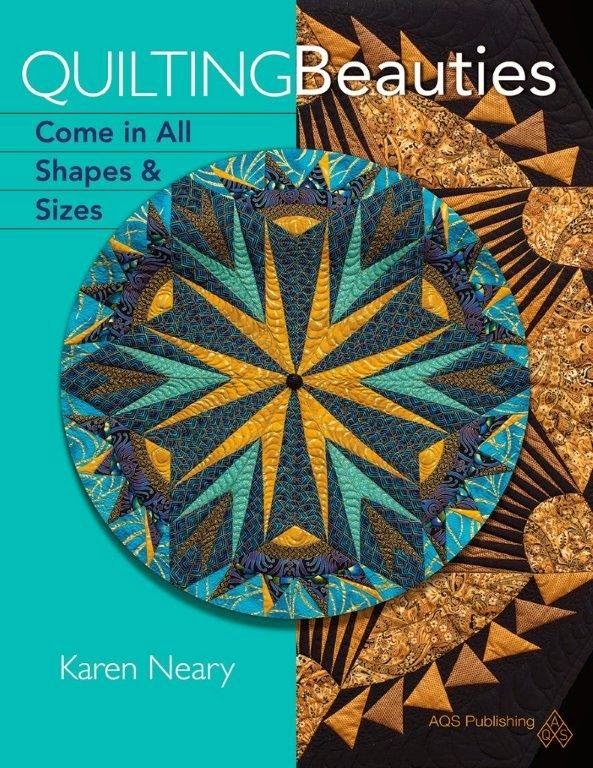 Because our Nova Scotia Fibre Arts Festival will roughly coincide with the release of my new book on New York Beauty quilts (being published by AQS in Paducah, Kentucky) my focus for festival this year made sense to be NY Beauty related. 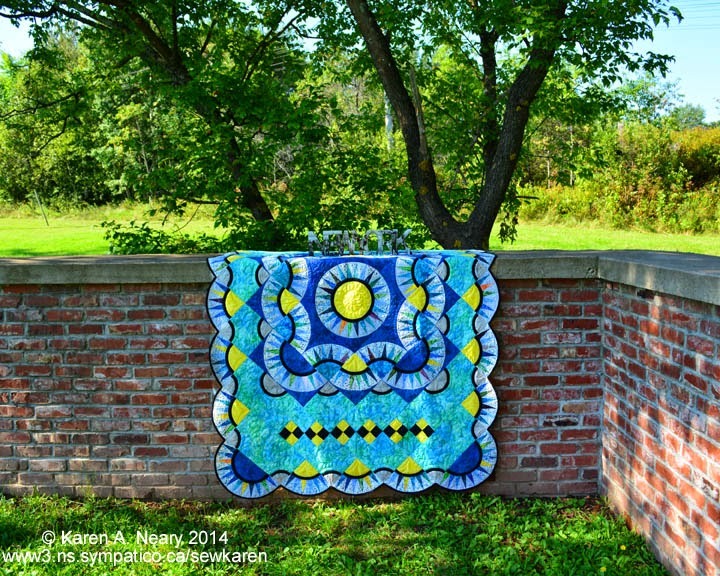 I decided to make a New York Beauty quilt to donate as a fundraiser to the festival. 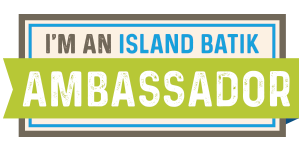 Mrs. Pugsley's Emporium chimed in and went one better for her contribution to the festival by donating a trip for two to New York City. Wow!!!! Even the construction was by no means a solo undertaking; Faithful Polly was ever-present ensuring those points were sharp. 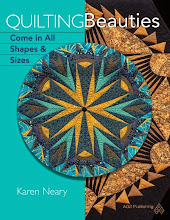 Cheryl worked her magic in double time; the quilt got sent off to the editor, and voila...it made the cover. I know I am biased, but what a stunning photograph! Mrs. Pugsley has ordered a whole carton of these magazines for her Emporium! They are available for purchase now, and during Fibre Arts Festival. 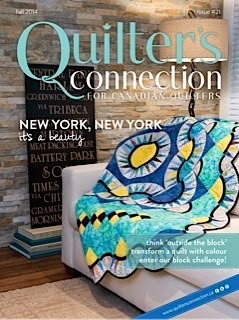 The quilt is on display now at Mrs Pugsley's Emporium, where the tickets to win the quilt - or a trip to New York! - are also on sale. Stop in and pick up a copy of this lovely magazine. Because of these connections made from Amherst, to Kentucky, California, British Columbia, Ontario and back to Amherst again... you may actually get to wake up in the city that never sleeps. It truly takes a lot of team work to make something like this happen and I am so grateful to have the help and support of such a fabulous crew. 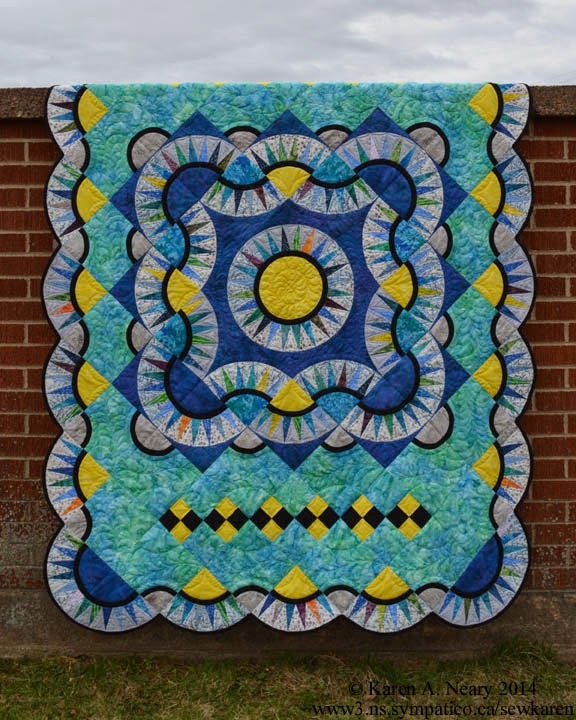 You're all invited to join me October 14-18th at Mrs. Pugsley's Emporium for a showing of NYB quilts, as part of the Nova Scotia Fibre Arts Festival. 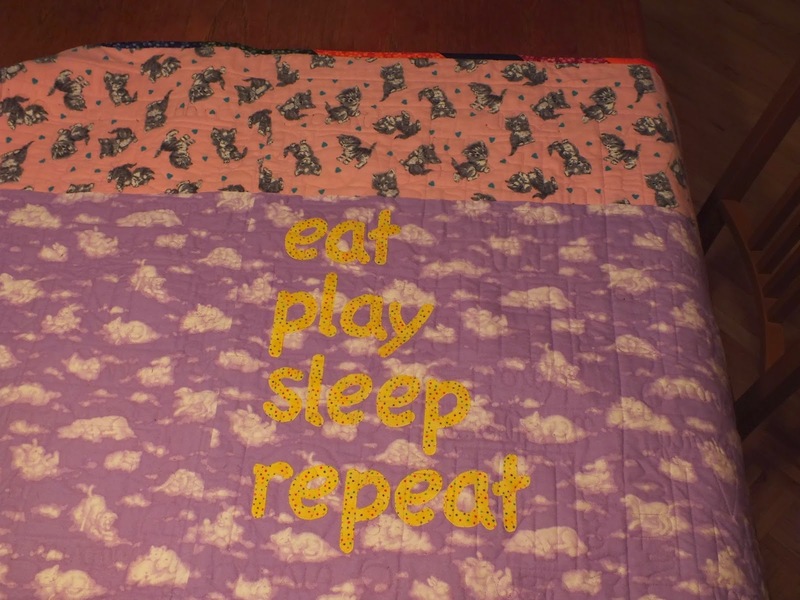 With luck, the book quilts will be back by then and part of the show. 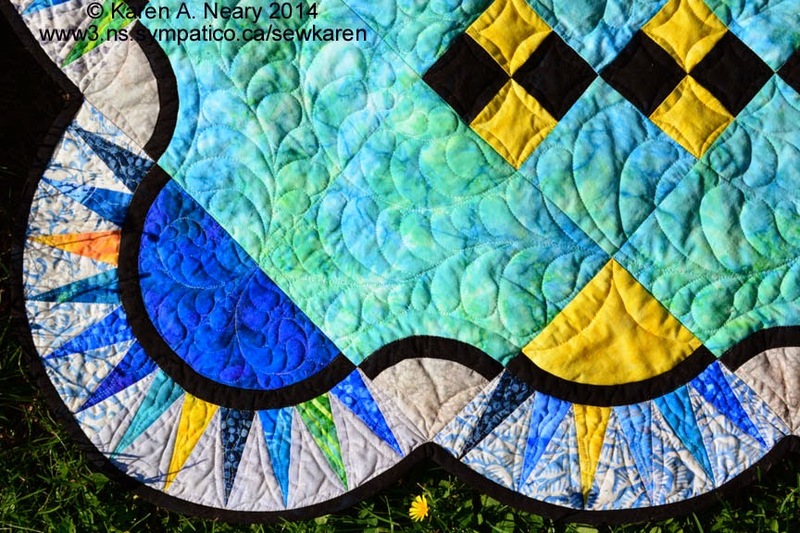 There's a lot of quilting going on in Alberta these days it seems! 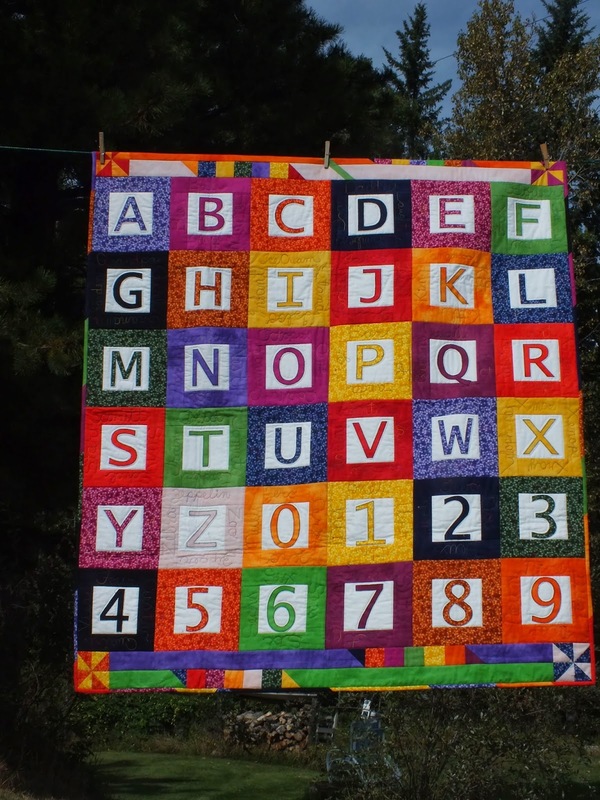 These pictures are from Lori-Lynn Slack of James River Bridge showing her prize winning Quilt Of Learning. 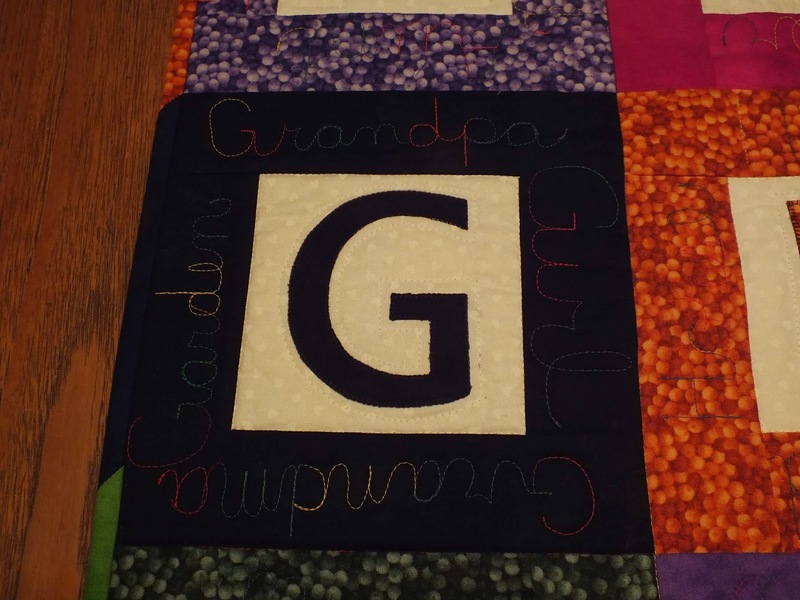 Lori made the quilt for a very special granddaughter and added a lot of fun touches. In the picture above you can see she has jazzed up the top and bottom borders. 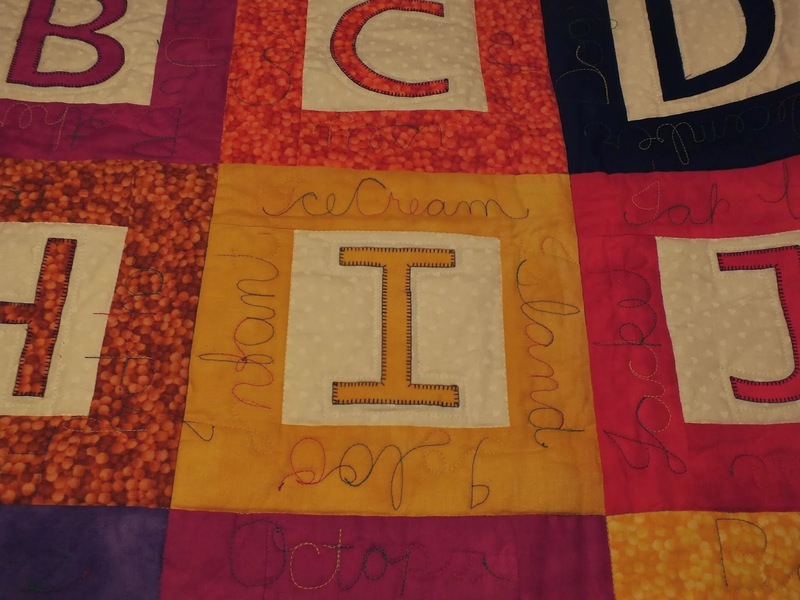 She has quilted words beginning with the appropriate letter in each block such as "Ice Cream" and "Island" around the I.
Lori entered the quilt in a local show where she won a second place ribbon. Way to go, Lori! I love what she put on the back. Super fun, and I know your granddaughter will love it! You can download the pattern instantly or order a printed version to be mailed to you from my website. Kits for the quilt using Trend-Tex precuts of Stof fabrics can be found in quilt shops across Canada including Mrs. Pugsley's Emporium here in Amherst. 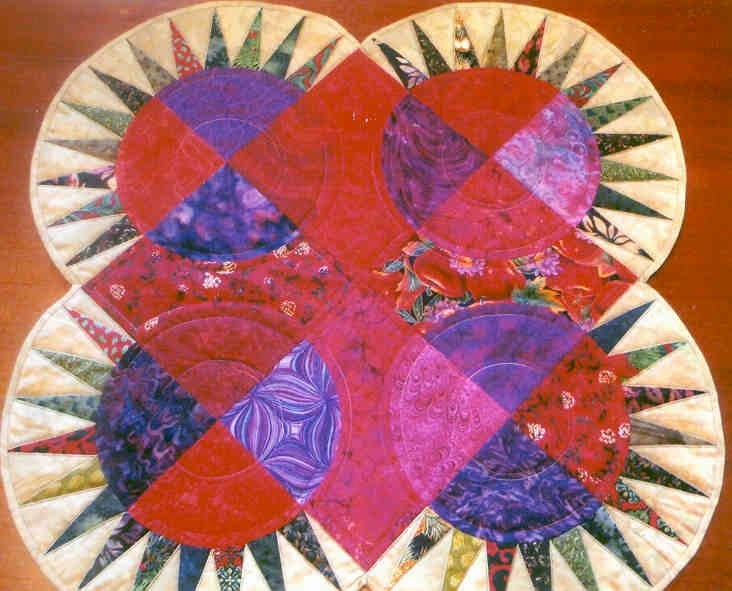 Although the picture doesn't show it clearly, Diane has done some spectacular free motion quilting in the centre sections. That pop of blue in the setting blocks along the side adds a lot of zing. 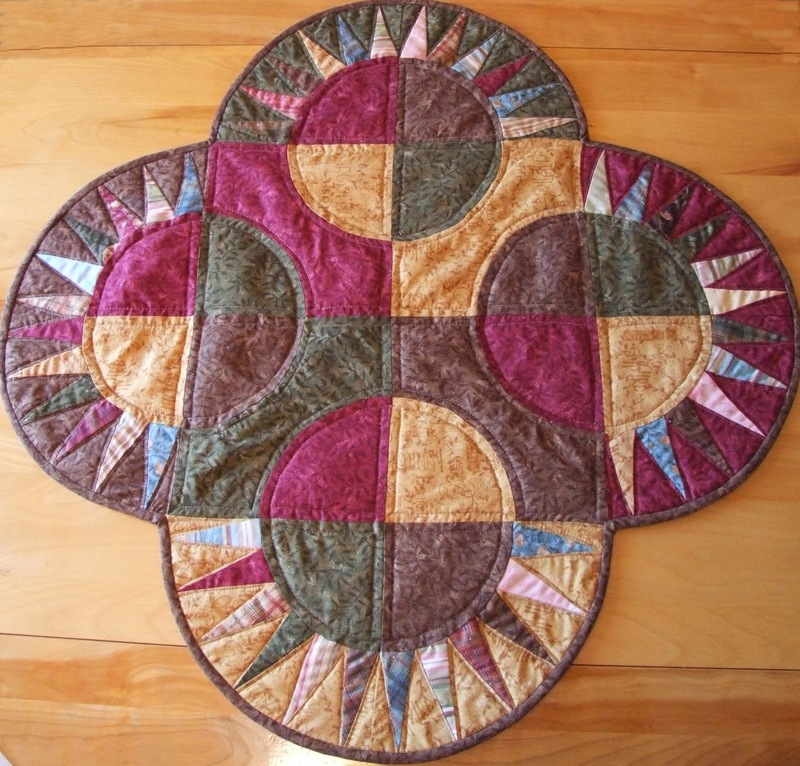 You can see two other of Diane's projects here and here. Thanks Diane - you do such beautiful work! Save Postage: Download Your Patterns! Little by little (as the cost of postage increases a lot by a lot!) 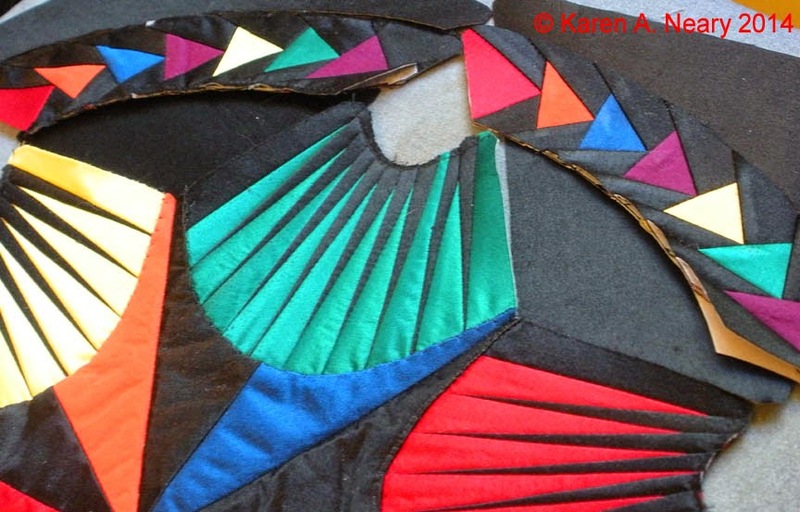 I am reformatting my patterns to make them available worldwide as instant digital downloads. It is not unusual for the postage to cost more than the pattern, especially when mailing overseas and to Australia and New Zealand. It's a slow process to convert- and not all my designs will work in an 8-1/2 x 11 format for easy home printing - but for the ones that do, this method makes perfect sense. Beginning about a year ago, I now have almost a dozen patterns available digitally. The direct download links may be found with the ordering information below each pattern on my website. Now when I design new projects, more so than ever I am doing so with an eye to the size of the blocks and templates. 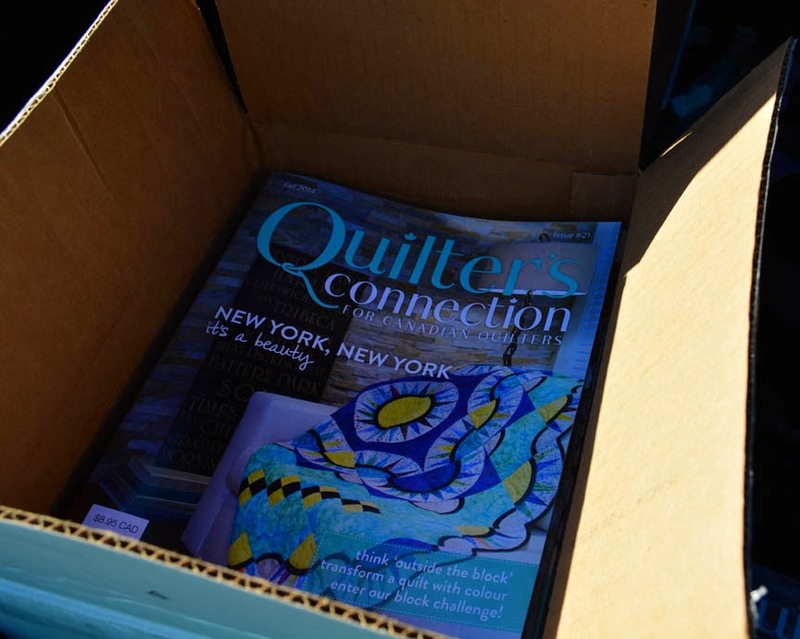 It's been a wonderful experience to connect with overseas quilters who no longer have to wait up to two weeks to receive their patterns. Yesterday I added one more, the very popular Maritime Beauty, which you can download here. 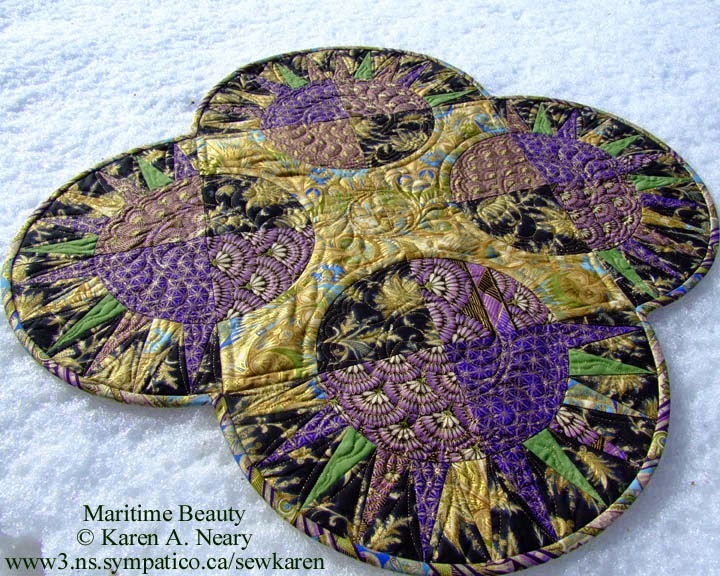 A big thank you to quilters world wide who have shared these images of their Maritime Beautys for us to enjoy! 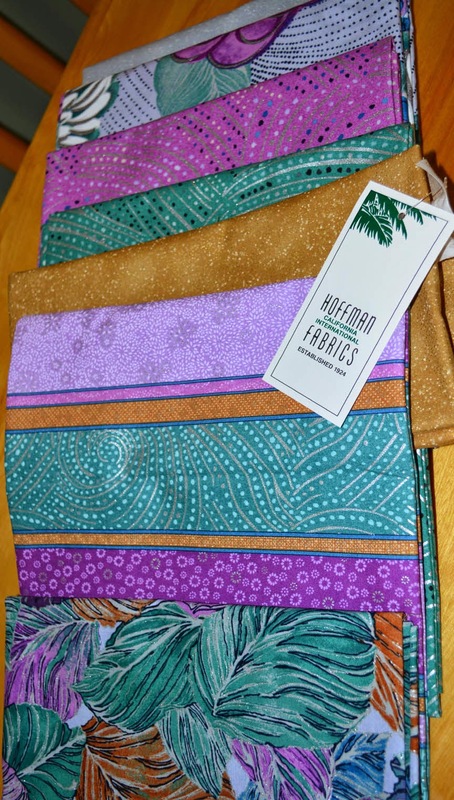 Yesterday I got new fabrics from Hoffman. Bellissima! You can see the different colourways here; I chose silver, orchid, jade and pewter with an antique beige/gold from their Blenders line to match one of the lines in the stripe. 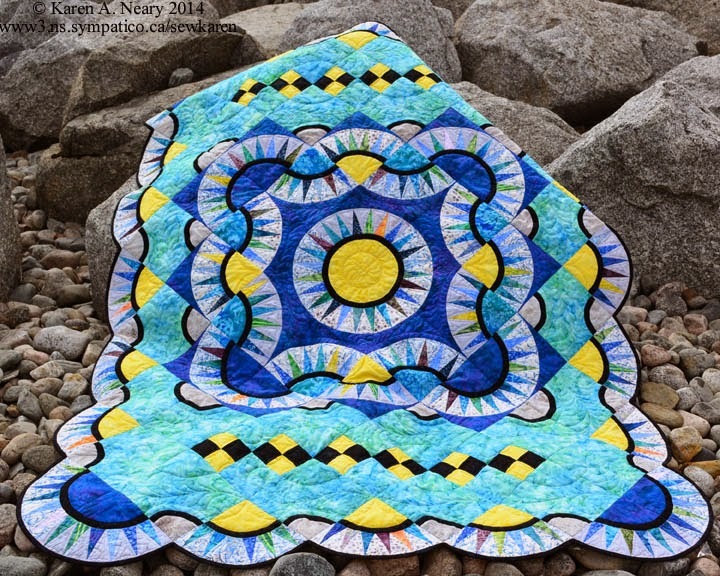 The collection includes a large floral, a swirl, a dot, a print and a stripe - a winning combination of patterns that always makes a stunning quilt. Since my Italian is not up to speed,I Googled "bellissima" to learn it is the feminine form of "bellissimo" which makes sense when you see this collection. Belissima indeed! Last month, Jeanne Kaye Speight shared this picture of her Santa's Trip Around The World. The quilt looked finished... but Jeanne decided it needed a little embellishment. A first place ribbon from the New Brunswick Provincial Exhibition! Way to go, Jeanne!